Adding a touch (or a lot of) colour in a wedding is one of many ways to bring out your personality and that of your partner. Whether it is a simple 2-3 colour palette for your wedding decorations, or a full gamut of rainbow colours in your outfits, colour influences not only how the wedding looks, but also how it feels, the atmosphere on the day, and how you and your guests will remember your big day in years to come. The choice of colour is obviously a very personal one, and often depends on how you are feeling about your wedding. Broadly generalising, gentle pastels tend to evoke romance and dreaminess, a celebration of love; bright colours tend to indicate fun, laughter, joy and the excitement of the day; and deep colours give a more serious, classic tone, with deep red an obvious reference to passion in love. Most people bring colour in the wedding decorations - chair covers, table centre pieces, buntings, etc. And of course, bridesmaids have always been the perfect carriers of colour, particularly if you have enough of them to create a rainbow! Here's a lovely example of bridesmaids in neon rainbow, by Etsy seller StaysiLee. But, in recent years, adding colour in the bride's wedding outfit has become quite popular. While some are bold enough for a deep or strong coloured wedding dress (or even hair), which generally mirrors their strong personalities, pastel or very pale coloured bridal gowns are a gentler way of saying that you're not a traditional bride, without straying too far from the expected. I particularly love the ombre and dip dyed effect for adding colour - it's a bit of a half way house between colour and traditional colours. How gorgeous is that dress by Cleo an Clementine (also on Etsy). Although mostly seen on tea-length skirts, or knee high ones, coloured petticoats can also be worn on full length dresses. How much you show underneath the hem is really all down to you. With the petticoat shorter than the actual dress, it is not readily seen, but teases with movement. Having the petticoat longer by a few centimetres than the actual skirt length brings on a band of colour at the bottom of the dress - this is particularly effective with shorter dresses, as seen with this beautiful 50's style dress by Atelier 5 Couture. A variation of the petticoat, is a contrasting lining is another way of adding a big splash of colour inside the dress, and is actually something that can be done with most dress styles. As with the hidden petticoat, a colourful lining shows the colour when you move about, walking and dancing, and can create some very interesting photo opportunities. This amazing photo from Pinterest is a great example of a bold print and colour effect in the lining. Whether they come with the dress, or whether it is an individual addition, a coloured sash or belt accentuates the waistline with a bit of contrast. Sashes tend to be tied with bows or a knot, which can be positioned at the back, or the front. If the loose ends are quite long and hanging freely, they add vertical length as well as a horizontal contrast. Belts tend to not have hanging ends, and are either attached with a buckle, hooks or clips. As such, the effect is mostly a horizontal contrasting band, with or without embellishment. The colour in the sash or belt can be that of the sash / belt itself, or in the embellishment, as exemplified by the Blue Lily Magnolia sashes shown below. For budget brides, a very effective way of adding a coloured sash is simply to buy a double sided satin or gros grain ribbon in the colour, width and length of your choice. Up to 4cm wide ribbons are fairly easy to find online or in any good haberdashery shop, in a variety of colour. Of course, the bouquet! Who doesn't have one at their wedding? Fresh flowers, artificial ones, fabric flowers, brooch bouquets, paper flowers, button bouquets, leather bouquets, the list and colour opportunities are endless. While natural flowers are the classic options for most brides, alternative materials provide an array of textures, colours and patterns that are not necessarily possible with fresh blooms. Moving a little bit away from the dress itself now, coloured shoes are extremely popular, in particular blue shoes, also acting as the Something Blue. Check out this little blog on the 11 most popular wedding shoes on OneFabDay.com, and you will find that none are in the traditional white or ivory. Indeed, coloured shoes are very attractive propositions from a usage perspective - with those, most of us will feel that at least we can wear them more than once. Colour matching is no longer an issue as it is now possible to have most style shoes dyed into a colour that you want, even those with embellishment on. For those who don't want full colour on their shoes, a little bit of colour can be added with shoe clips with some form of embellishment on. This gives a little bit more versatility in that the shoes can still be worn with or without the clips. High up on the colourful list in the headpieces category are floral wedding crowns, which have become very popular in recent years, and fascinators, which are traditionally worn more by guests. Along with headbands and headscarfs, flower crowns and fascinators have got enough substance to create more colour than a standard tiara. As with alternative bouquets, floral crowns with artificial or alternative materials enable a wider colour choice, and colours that may otherwise not be available for natural flowers, for example, these bespoke red polka dot bridesmaids flowers for a rockabilly wedding. For those who love to add something else that embodies their personality, then imagination is their limit! 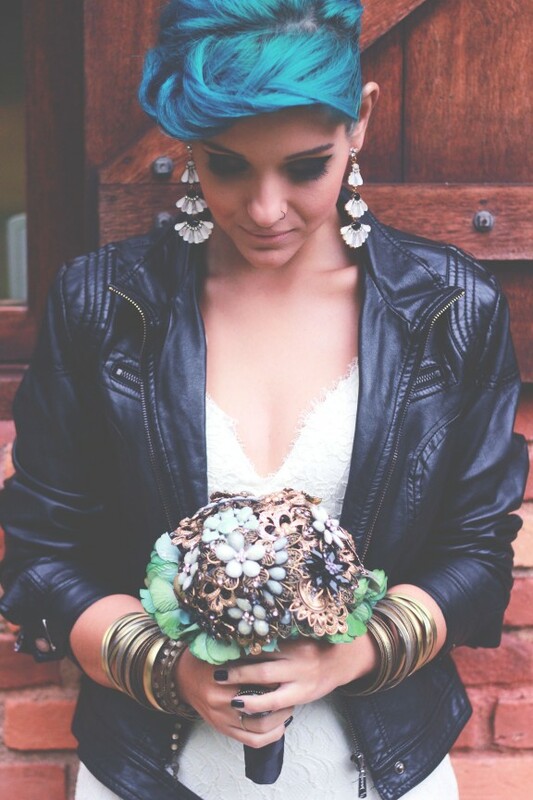 Whether it is colourful statement necklaces and other jewellery, coloured veils, funky glasses or sunglasses, hats or coloured hair, jazzing up a wedding outfit, can be really fun and unique, as shown by this Rock n Roll bride. It all really depends on where you want the colour, how much of it you would like to show. So, even if you're a traditional bride, don't be afraid of a little bit of colour and pattern! And if you looking for ways to brighten your wedding, hope that this blog has given you a few ideas. Blue Lily Magnolia makes bespoke and unique bridal accessories, including bouquets, hair acccessories, corsages, belts and sashes, boutonnieres, garters, and everything else a bride, groom or bridesmaids might need. Browse existing designs and ready-to-wear items on my Etsy store, or contact me for something designed and made specially for you.